A city in Connecticut has become the first in the United States to issue identity cards to illegal immigrants. New Haven - best known as the home of Yale University - is offering the cards to all its residents, including to some 12,000 undocumented immigrants. City leaders say the plan will enable immigrants to open bank accounts and make them less vulnerable to crime. "The simple straightforward purpose here is to build a stronger community," he said. "You can't police a community of people who won't talk to our cops." Bill Farrel, of Southern Connecticut Citizens for Immigration Reform, said: "It's going to be a welcome mat for illegal aliens to come to the region, flood the labour market and dry up working-class and middle-class jobs." New laws and proposals in more than 90 cities or counties across the country include prohibiting landlords from renting to illegal immigrants and penalising firms that employ them. 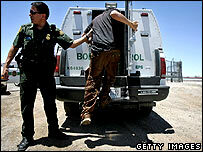 Last month, US President George W Bush's plans for immigration reform collapsed in the Senate amid strong opposition.